First published in 1937, We Met Our Cousins concerns John and Antonia who are sent from London to spend the holidays with their Scottish cousins who live with their grandfather at Roid House in the Scottish Highlands. 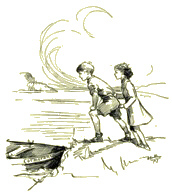 The children are initially incompatible, with John and Antonia (from whose perspective the book is written) cosseted and rather precious whilst Angus and Morag and the younger Hamish are wild and scruffy and spend their time riding and sailing. Despite a prickly start, the cousins get on well, with the Scottish children learning to tolerate their cousins namby-pamby ways and John and Antonia toughening up a good deal. When John saves wee Hamish from a maddened bull, friendships are firmly cemented. Whilst rehearsing a play to be performed for the local children, the four cousins also manage to solve the mystery of Mrs Creach’s stolen jewels and to discover the truth of the MacTavish and MacAlister feud. A lovely story, enlivened by Anne Bullen’s wonderful illustrations. In the sequel to We Met Our Cousins, the cousins come to London for Christmas. The adventure starts when they get up at dawn to fight a duel in the Square gardens and catch the burglar who is stealing State papers from Lord Peveril's house. Then they spend all their Christmas money on buying a pony out of an old rag-and-bone-man's cart, and christen her London Pride. But can they keep her hidden in the summer house in the Square without anyone knowing? Joanna Cannan (1896-1961) was born in Oxford and educated on a very part-time basis at Wychwood School. She attended a finishing school in Paris, but was prevented later from taking up a place at the Slade School of Fine Art by World War One. After her marriage, she found herself rather marooned in the Wimbledon suburbs and took to writing as a means of supporting her family, given that her husband, despite an heroic war record, found earning a living in civilian life difficult. In 1931 the Pullein-Thompsons moved to the Oxfordshire countryside where she continued to write amongst a somewhat bohemian household. Although perhaps best known for her adult novels such as High Table, The Misty Valley and her detective fiction, such as Murder Included, Joanna wrote a number of children’s books. Her three daughters: Josephine, Diana and Christine Pullein-Thompson arguably defined the post-war pony book genre, although it was Joanna herself who established this type of children’s fiction, with her book A Pony for Jean and its sequels Another Pony for Jean and More Ponies for Jean. 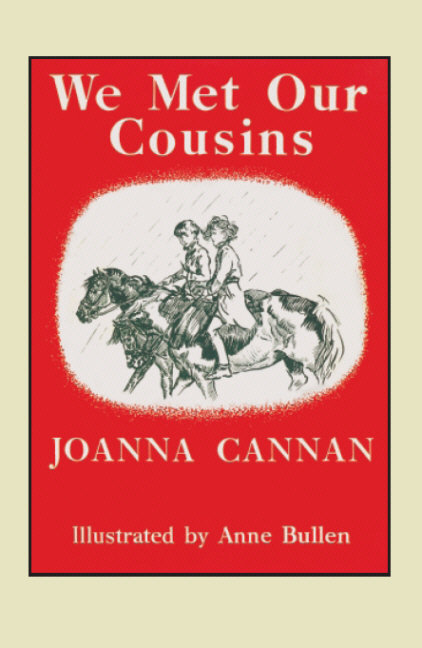 Fidra’s first Joanna Cannan title will be We Met Our Cousins. This was written in 1937 and concerns the adventures of two London children sent to visit their wild cousins in the Scottish highlands. 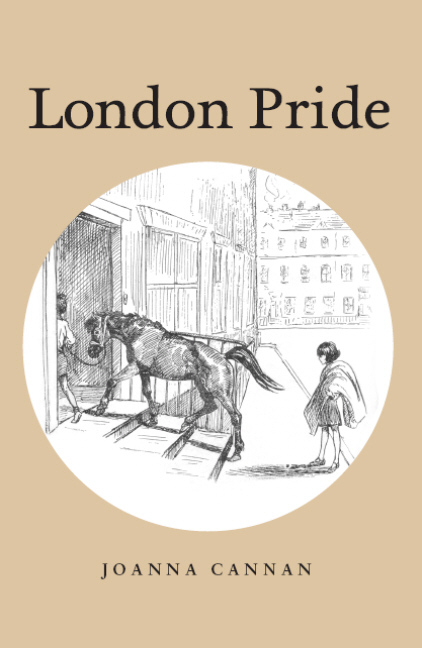 Our second title will be London Pride and following this we will be reprinting the three Jean books. We Met Our Cousins will have an introduction written by Josephine Pullein-Thompson.